Pronounced “Kash”, Kas is located in Turkey. 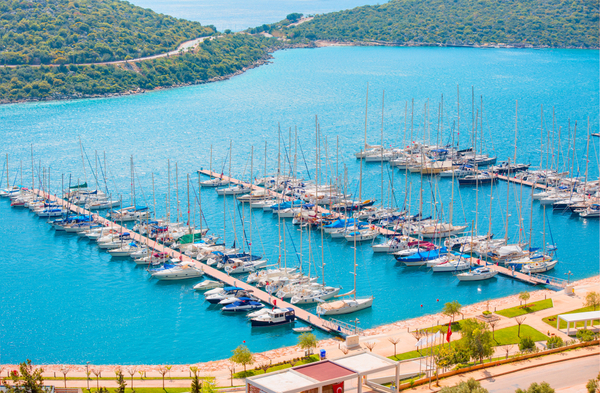 The city of Kas is a truly unspoiled, and charming Turkish destination. 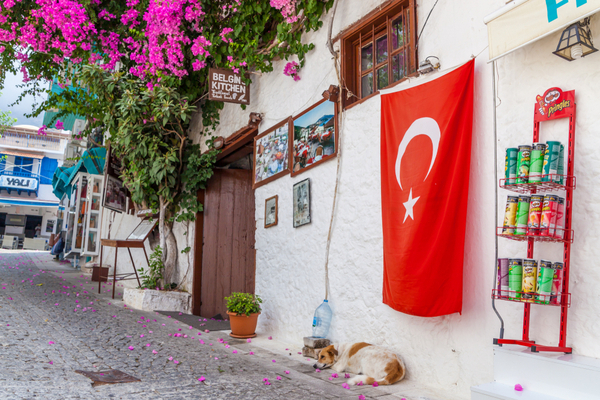 Historically, Kas was once a busy and thriving Fishing town. Yet today has become a popular, yet quiet, destination for those looking for something unique for their holiday. Attracting a wide range of singles, couples, and families, there are so many things to do in Kas. 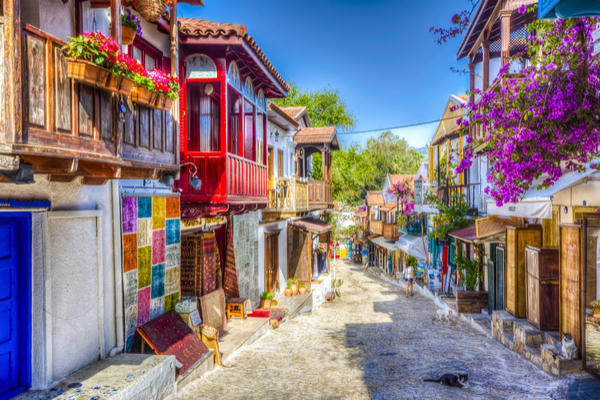 With much to see, do and explore, Kas is a unique town that is one part tranquil and another part exciting. Kas is a small town and a district of the Antalya Province. 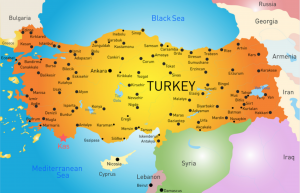 The town is located on the southwestern side of Turkey, overlooking the Mediterranean Sea. Kas is easily reachable by both Antalya and Dalaman airports, with many European countries offering direct flights to both airports. Today, Kas has become a very popular tourist destination. This majestic city is home to around 9,000 locals. The streets of the town are filled with adorable little shops and cafes, restaurants and bars and plenty of unique attractions. 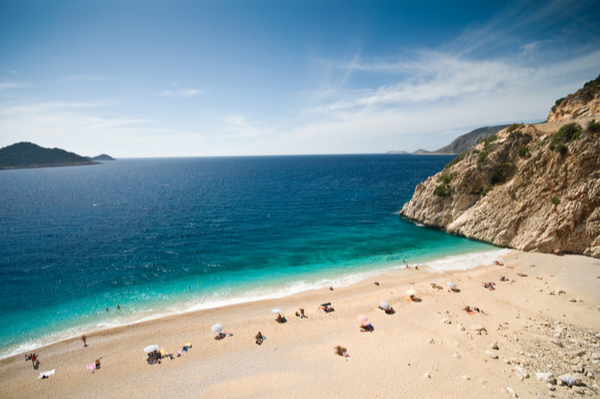 The town of Kas is truly a hidden gem offering a wide array of shopping and coastal activities. Kas is also home to some very unique shops, centered on antiques, jewelry, and clothing. There is an authentic artsy vibe with the local workmanship and style here by the coast. Aside from these fantastic little shops, there are several outdoor activities to consider to explore. From scuba diving, paragliding, and boating activities, you’re surrounded by miles of pristine beaches, and just a short boat ride away from Greece. 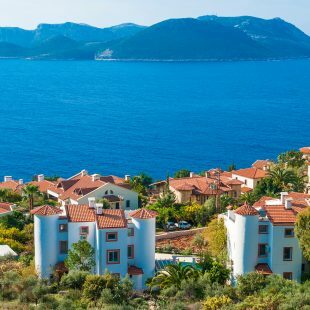 With so many things to do in Kas, this town is truly an unforgettable destination where you will experience and witness some of the worlds most outstanding sea and coastal views of the Mediterranean Sea. If you are interested in more of the relaxation and beach attractions, Kas is really a perfect place to consider for a unique family or couples vacation. The homes along the streets of the town are filled with dreamy oceanic style villas. After lunch, jump on a boat and venture over to Greece or Cyprus to catch the sunset. If you’re feeling really adventurous, check out this article on local paragliding- you’ll surely get some Instagramable photos up there. If you are looking for all night parties, rows of bars and clubs that stay open until the sun starts to rise, then Kas is not for you. 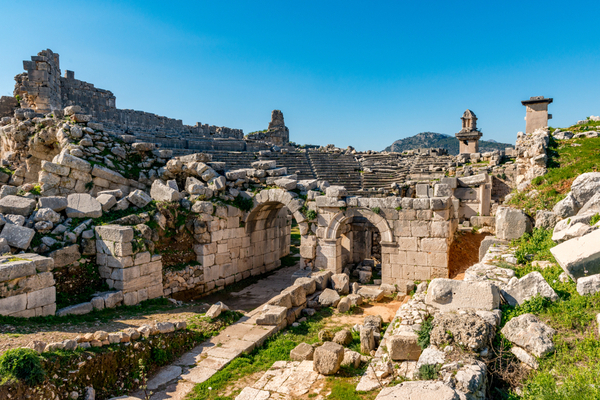 Although you can still enjoy a fantastic night out, there are other areas of Turkey that will be more suited for late night entertainment if this is what you are looking for. Now that doesn’t mean this town is a ghost town at night, as a matter of fact, there is an Old Amphitheater, The Theatre of Antiphellos Ancient City is a special place where you can occasionally catch a concert in the evening and enjoy some rather rad historical structures and views. The city of Kas is also generally safe, so no worries about venturing around the city alone at night. 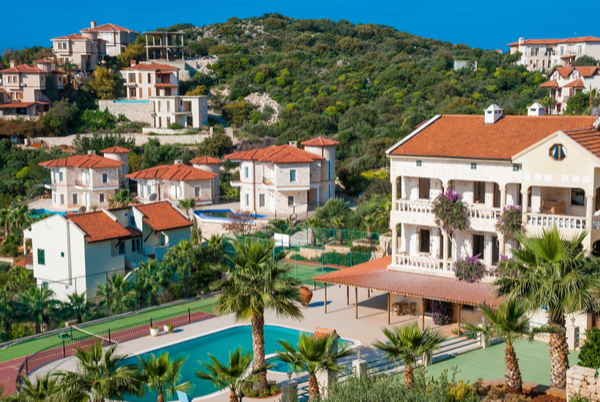 If you are looking for somewhere to stay in Kas, we have some options for you. One thing is for sure, you will not be disappointed! As recommended in an article from UK Telegraph, we found some great options for the more popular homes and villas to accommodate your stay. These homes offer a touch of luxury at a very affordable price. 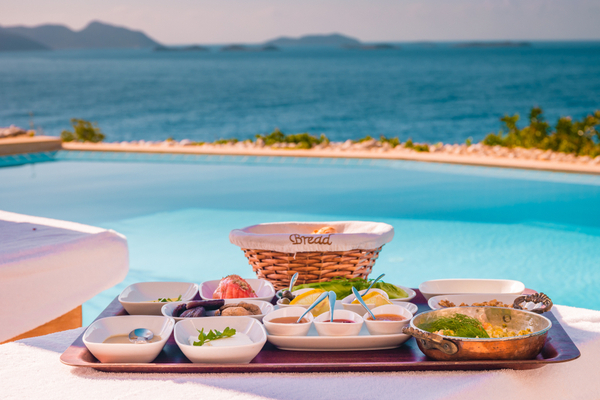 Aside from the many luxurious options, there are also several mid-range accommodations in Kas. Most hotels and villas offer breakfast, and many have pools but who needs a pool when you have these stunning ocean views! Since Kas has limited hotels and guest houses, booking early is highly suggested to avoid unavailability. Many of the places in Kas book very quickly by return visitors and weekenders visiting from other countries close by. Even though there is a decent selection of places to stay during your holiday, the sooner you book the more choice you will have. Between April and May, the town starts to get busy as sightseers and jet-setters travel venture to the area. 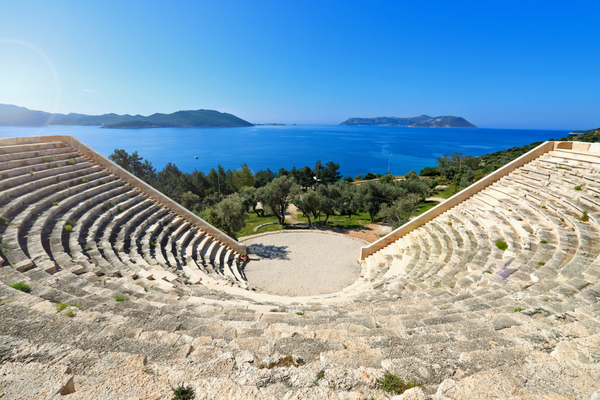 With so many things to do in Kas, you’ll fall in love with this majestic city and enjoy one or more of the 300 days of sunshine that Kas enjoys every year.